Former Kent and England wicketkeeper Paul Nixon believes James Tredwell can successfully combine the Kent captaincy with an international career. The off-spinner was England's leading wicket-taker in the one-day series in India this month. "Treddy has all the qualities," Nixon told BBC Radio Kent. "He must make sure he looks after number one first. "He's in a good place mentally and knows he can do it at international level. Now he wants to do it more." 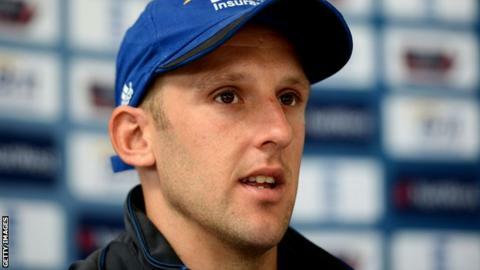 Tredwell is currently in New Zealand ahead of England's limited-overs internationals against the Kiwis, with Graeme Swann also returning to the fold having been rested for the India series. Although coach Ashley Giles suggested the two can play in the same side, Nixon admits the Nottinghamshire spinner is the better option. "Graeme Swann is number one in the world," he continued. "He's one of the best we've got. He's a character and every workplace needs a joker. "Treddy is very quiet, calm and level-headed and lets his cricket do the talking. "But what's to say Swanny isn't going to break a finger in practice? I'm delighted for Treddy. He's chipping away nicely at Swanny's heels." The 30-year-old replaced Rob Key as Kent captain in November, when the former England batsman stepped down after seven years at the helm. And Nixon believes Tredwell will be a different kind of skipper to his predecessor. "I remember keeping to him as a youngster and remembering this lad's got a serious talent and a great mindset for high pressured situations," he said. "He's a bit like MS Dhoni. He's doesn't show any emotion and gets on with the job. Inside, he's got a lot of passion." "He's had some good leaders in the past. Dave Fulton, Steve Waugh, Rob Key - he'll have taken little bits from them. "He'll take the strength of the coaches and senior players and add his touch of magic."